Barbecoa. A stone’s throw from St Paul’s and conveniently located on the first floor of the New Change shopping centre. 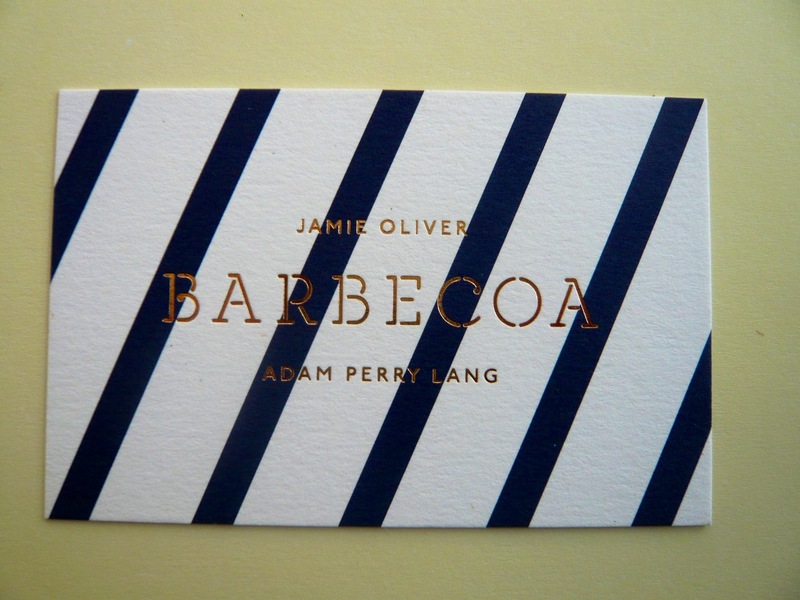 A collaboration between Jamie Oliver and NYC restaurant Adam Perry Lang, the restaurant promises meat, more meat, and then a little bit more meat. It is meant to be a meat-lovers’ restaurant and comes with its own high quality butcher on site. Just a few weeks ago, a friend of mine from Boston was in town for work. His company’s London offices are conveniently located a stone’s throw from my office meaning we usually manage to see each for at least one dinner when he is in town. Having exhausted all the usual culprits around the City (Cote Brasserie, I am looking at you) and wanting an excuse to finally try Barbecoa I was lucky enough to get a table at short notice as there had been a cancellation. Although that meant we got the worst table in the entire restaurant (let’s just say having to walk through the entire restaurant only to be shown the last table in the restaurant, wedged between a pillar and a table of noisy investment bankers is a walk of shame in its own category! ), but at least that meant I got to check out the entire restaurant and the patrons. Being smack bang in the middle of the City, there were the usual suspects of investment bankers and City lawyers, the occasional post-work second or third date (though given the poor acoustics in Barbecoa I cannot recommend this restaurant if you are still trying to get to know one another – my friend and I were mostly screaming at each other (though things did improve somewhat when the noisy investment bankers next to us left)). On to the food. Instead of ordering one main each, we ended up ordering a bunch of starters and nibbles to share, together with some bread and pickled vegetables. Although nicely presented (thin, pointy mini carrots with the green bits still on were involved), taste-wise I was not convinced by the pickled vegetables. There were carrots, cauliflower and some chilies and neither the pickling juices nor the vegetables themselves were particularly flavoursome which is a pity as I am definitely a fan of pickled veg (and having pickled my own vegetables before it really isn’t that hard to get some flavour into the pickled veg!). I cannot fault the bread (which many, even very good restaurants, surprisingly cannot get right) – the bread was fresh and included some freshly baked flatbreads as well as some toasted sourdough bread drizzled with olive oil – both perfect for “fare la scarpetta” (how the Italians call the frowned-upon wiping clean of one’s plate with a piece of bread). We kicked things off with a salad of roasted beets, smoked walnuts and goat’s dressing. Now while I want the recipe for those smoked walnuts (they basically tasted of smokey bacon – how awesome would those be in chocolate chip cookies? ), I do think the dishes’ description was not entirely accurate and the dish should be renamed – there was so much watercress on our plate it took us a while to find the three lonely pieces of very al dente beetroot. Also, while the idea of a goat’s cheese dressing sounded nice, what it meant was that the goat’s cheese had been mixed with something else (cream? milk? oil?) to, I guess, achieve a pourable consistency, but this also meant that a lot of the unique goat’s cheese taste was lost given the dilution. The beef carpaccio was good, cut slightly less thin than I am used to and just coloured on the outset, it was covered with lots of pepper, which, as my friend remarked, is a good thing if you are into pepper (admittedly they had been a bit heavy-handed with the pepper), but less might have been enough as well. And, some shaved truffle and parmesan finished the dish. A dish we both agreed was fantastic was the gravadlax. My friend initially wanted to veto this choice – we were in a place called Barbecoa after all – eating fish, in particular the non-barbecued kind was surely sacrilegious – yet my dad has recently started curing and smoking his own fish so I was curious to try this. Besides, the key aspect of curing fish is what it is cured in (in a very similar way to the dry-rubs and marinades used for barbecues). We both agreed this was likely our favourite dish of the evening. The dish came with several slices of brightly-hued salmon (thanks to being cured in beetroot), served with sour cream, lemon, dill, mustard trout roe and a shot of something alcoholic (Schnapps methinks) both me and my friend had to pass on. There were some baby back ribs which were so tender the meat cleanly fell off the bone (serving me the embarrassment of having to use both my hands to devour the rather tasty ribs to then proceed to lick my fingers clean … Yes, I would have totally gone there.). Although a shame to order this (i) in a barbecue place and (ii) outside of Italy, we ended up ordering the burrata with San Daniele prosciutto and fresh figs as well. A type of cheese that basically mens ‘buttered’ in Italian is hard to pass up, even if it does taste better the fresher it is (yet again proven to me this weekend when we had fresh buffalo mozzarella as part of our lunch at Alessandro’s dads that had been made fresh that morning). As simple as this little dish was to put together and given the decent quality of the ingredients involved, we could not really fault this dish, though there was clearly not much skill involved in preparing this. Because it really stood out for me, I wanted to mention the panna cotta we had for dessert. Anybody who understands a tiny bit of Italian (and thus knows that panna cotta stands for ‘cooked cream’) should be appalled by what is typically served as panna cotta in restaurants. Instead of the more authentic recipe which calls for the cream, together with the sugar, vanilla bean and, most importantly, cornstarch or potato starch, to be stirred on medium heat until the cream is thick enough to coat the back of a spoon, many places now rely on using gelatine as a thickening agent. This makes the process much easier and the results more predictable. However, there is a marked change in texture when using gelatine, to my mind the end result is more like a vanilla-cream flavoured jello than the very thick cream panna cotta should be (thick enough so that you can invert it on a plate and it will hold its shape yet creamy at the same time). Well, I am glad to say that the panna cotta at Barbecoa (served with rhubarb, what a great combination) was thick and creamy but reminded me in no way of jello. Result my friends! 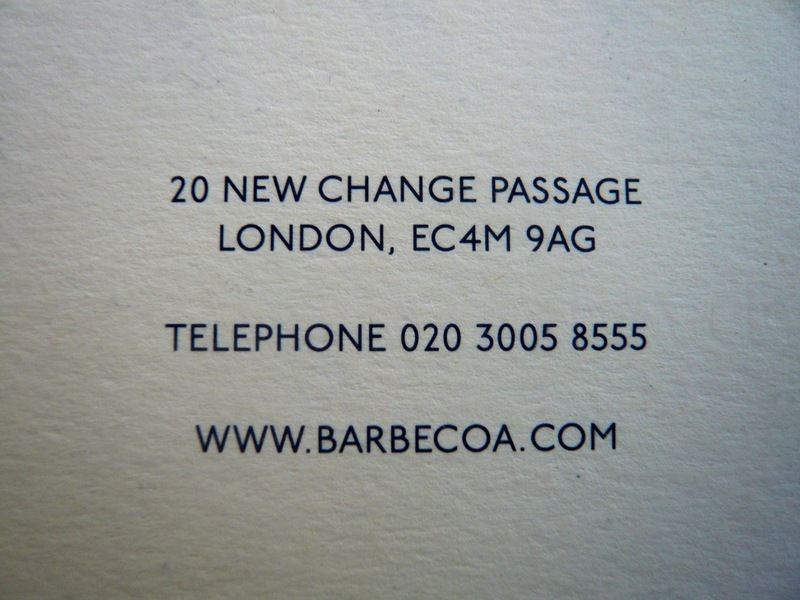 So would I go to Barbecoa again? Probably – we barely made an inroad into the meatier parts of the menu so I feel I should give it another try. However, there were a few things that put a bit of a dampener on our dinner: the acoustics are terrible and the place is super noisy so just don’t expect to be able to hold a conversation; and the wine menu is nothing to write home about and is, in my eyes, overpriced – wine sold in the UK is invariably overpriced as compared to the continent, but paying £9 for a large glass of Neroamaro when the entire bottle retails, on average, for £9 is a bit of a joke. Although, wine is probably not the best drink to have with barbecues anyway, so next time I would stick with beer or cocktails.